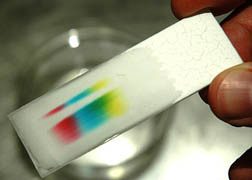 Thin Layer Chromatography (TLC) is the most analytical technique for an organic chemist. 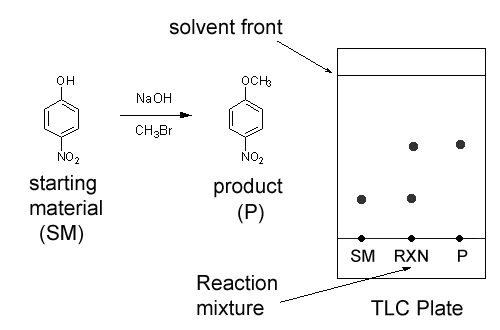 It allows you to "see" what's going on inside a reaction by answering questions like: -Are products forming? -Are reactants being consumed? -Are any side reactions taking place? Thin Layer Chromatography (TLC) is a cheap and quick way of determining how many unique chemicals are in a reaction mixture. For example, let’s say you have a reaction with two chemicals (shown below) in a round bottom flask. To run a TLC, you use a pencil (not pen) and mark a line at the bottom of the TLC plate. Then mark a dot (again using pencil) for each compound you want to analyze. Then, using a capillary tube (thin piece of glass) you add one small drop of each compound you want to analyze to the TLC plate; sometimes we call this “spotting” the TLC. Finally, place the TLC in a jar or beaker containing a TLC solution for a few minutes. The solution will travel up the TLC plate and split each spot into its components- one for each compound. The highest point the TLC solution travels is called the solvent front. After the TLC, mark the solvent front with pencil. In the TLC below we made three spots: one for pure starting material (SM), one for pure product (P), and one for the reaction mixture (RXN), which contains both starting material and product. 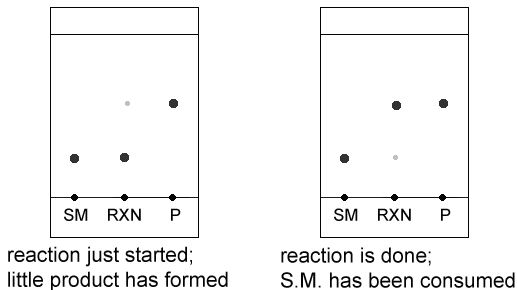 Notice that the reaction mixture spot split into its two components. This is very useful while running a reaction because it tells you “how the reaction is going”- when a reaction first starts, most of the reaction mixture is starting material. You know when a reaction finished because all of the starting material has been consumed. TLC is just another type of chromatography so there is a mobile phase and a stationary phase. In TLC the stationary phase is silica gel attached to the TLC plate. 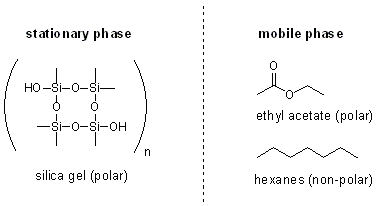 The mobile phase is the TLC solution- usually mixture of a polar and a non-polar organic liquid, such as ethyl acetate (polar) and hexanes (non-polar). The distance a spot traveled can be given in Rf values (retention factor). Let’s say the distance from the base line to the middle of spot P is 25 mm, and the distance from the base line to the solvent front is 40 mm. 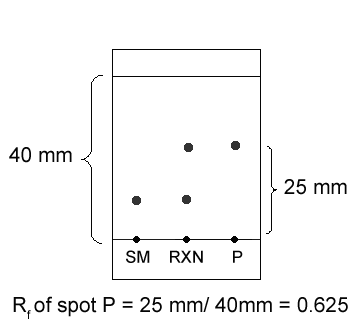 The Rf of spot P is the ratio of the smaller number to the larger number- 25:40, or 0.625. The key to TLC is to understand that polar compounds stick to the TLC plate! 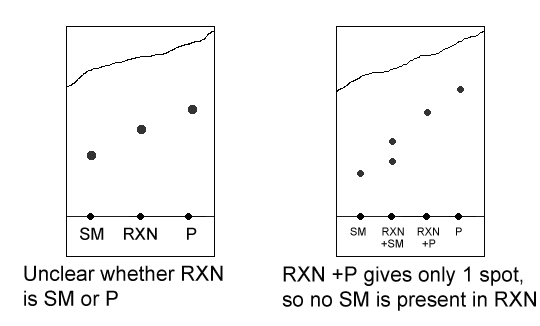 This means that the more polar the compound, the lower its Rf value. This is because the stationary phase (silica gel) is polar. Because of “like dissolves like”, polar compounds have an affinity for the silica gel and have a harder time moving past it. 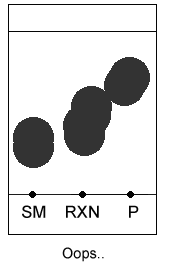 The more polar the TLC solvent, the larger the Rf values for every spot. It takes some trial and error to find the right solvent system for a particular reaction. If the solvent system is either too polar or too non-polar, the spots will clump together and the resolution won’t be very good. TLC spots are usually invisible. One way to seeing them is by shining a UV light on the TLC plate. Only molecules that are UV active can be seen this way. Another method is to use a developing solution to “burn” your TLC spots. This is done by dipping your TLC plate in the solution and then heating the plate with a hot-air blower. It works because chemicals in the developing solution react with the spots on your TLC plate and change their colors. Finally, TLC plates can be developed using iodine, which will also react with the spots and give them a color. Whenever you run a TLC always make sure there is a lid on your TLC chamber (the container that holds your TLC plate). Otherwise, the vapor pressure of the TLC solvent will be too low and it will take forever to run your TLC. When you place your TLC plate into a TLC chamber, the level of the TLC solution must be below your TLC spots. Otherwise, your spots will spread unpredictably over your TLC plate and your results will be unreliable. If this happens you’ll have to prepare a whole new plate, so be careful. When you spot a TLC plate you only want to use a little bit of a sample- one touch from a capillary tube is usually plenty. Otherwise your spots will be too big. Sometime your reaction mixture will be too concentrated to do TLC. In this case, remove one drop from your reaction and dilute it by adding some TLC solvent, and then spot your TLC plate. A lot of times the solvent won’t go up the TLC plate in a straight line- it’ll curve to one side or the other. This makes it harder to read the TLC plate. For example, in the left TLC plate below, it’s unclear whether the reaction is finished or has just started- because the solvent didn’t travel up the plate straight, we can’t tell whether the reaction mixture is the same chemical as the starting material or as the product. To fix this, we do some double spotting. Instead of just spotting the reaction mixture, we spot both the reaction mixture and the starting material, and the reaction mixture and the product. In the right TLC plate below, we know that the reaction is complete because the reaction mixture/product spot gives only one spot- that means that the reaction mixture and the product are the same (that is, the reaction is done). This is short lab. You’re going to run TLCs on a few over-the-counter drugs (acetaminophen (Tylenol), ibuprofen (Advil) etc.) and then using your results you will identify the components in an unknown sample. When I used to TA this lab I noticed that students tend to allow their TLC solvent to travel much higher than necessary- this takes more time. A 3-4 cm solvent front is plenty tall for a TLC plate! Pay attention to the “double spotting” section I wrote above. It will be useful for confirming the identities of your unknown. For example, if you think your unknown contains ibuprofen and acetaminophen, then you should add your unknown, pure ibuprofen, and pure acetaminophen to the same TLC spot. If you’re right this should only give two spots. If it gives more than two spots it means another chemical must be present. Q: Why do you use a pencil and not a pen to mark TLC plates? A: If you use a pen you’ll get ink on your TLC plate. Ink is a collection of different chemicals- you would see lots of spots after running your TLC! Q: Can the Rf value ever be more than 1? A: No. Rf is just the ratio of how far a spot traveled compared with how far the TLC solvent traveled. Because no spot can ever travel further than the solvent traveled, the Rf will always be less than or equal to 1.